Anraya Palmer (she/her/hers) loves La Croix. 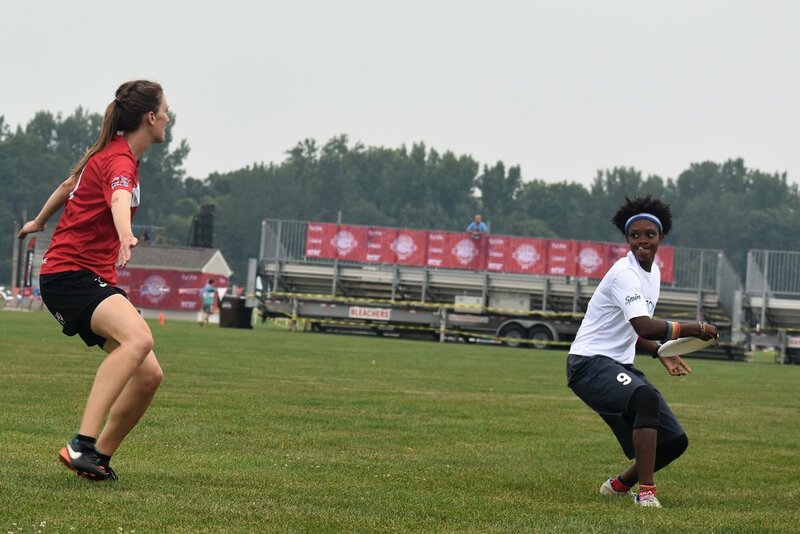 Check out this in-depth interview to find out more on where she's from, her ultimate experience, and what she wants to see for the future of ultimate. Aaron Liu: Where were you born, where did you grow up, and where do you call home? AL: How did where you grew up affect you as a person? AP: I grew up in a suburban, middle class neighborhood. My parents moved us out of an area where the school systems were starting to fail. I was lucky enough to get a great education from a great school system. My parents were fantastic providers. They were happy to drive me all over Georgia for soccer and basketball. I used to work at a low income area school so I realize how great my upbringing was compared to some of those kids. Both parents at home, in a safe neighborhood and they were able to provide for me and my brother. Not everyone is that lucky. AL: What do you do or want to do for a living, and why did you choose that career path? AP: I am an elementary school teacher. I will be working with 3 year olds this school year. I got into teaching because I loved coaching and working with kids. I’ve been coaching high school kids for about 5 years now. Going from coaching to teaching seemed like a natural transition. AL: What are your favorite and least favorite parts about living where you do? AP: I love living in Decatur/Atlanta. It is a very diverse area and there are lots of things to do. So many restaurants that I love to go to. There is always something going on: festivals, concerts or just hanging outside somewhere in town. AL: What ultimate teams/clubs are you associated with? AP: I currently play for Atlanta Ozone. Earlier this year I played for the Atlanta Soul, a women’s professional ultimate team. Before Ozone, I played on Atlanta Outbreak. That team was huge in my development and I will always support that team! AL: When did you start playing ultimate/how long have you been playing ultimate? AP: I started playing my senior year of high school. I’ve been playing for about 8 years now. AL: How were you introduced to the sport of ultimate? AP: I was introduced to ultimate in high school. After my senior year of basketball, I didn’t want to commit to another soccer season. One of my friends played ultimate and spent forever trying to convince me to come play. I finally gave in and decided to play. One of the best decisions I’ve ever made! AL: When you first joined, what did the Atlanta area frisbee community look like? AP: The Atlanta ultimate community used to be very adult male dominated. So many opportunities for male players to play. Also not as many options for youth players. Only a few high schools had teams. AL: What does the Atlanta area frisbee community look like now? AP: The scene has changed a ton! It has grown tremendously since I first started playing. The community is still male dominated but there are so many more women playing now. We have 3 women’s club teams, a women’s league, women’s teams in high school and so many women coaching. The youth scene has exploded too! Several high schools and even some middle schools have teams now. We have high school and middle school rec leagues available in the fall and summer, as well as 4 YCC teams. AL: What change have you seen in the ultimate community that you want to see more of? AP: I love the growth of ultimate in Atlanta. I would love to see the sport continue to grow. I want more kids and women to play. I would also love to see more diversity within my ultimate community. Minorities in the sport is one area I haven’t seen as much growth in ultimate as I’d like. Really hoping the Atlanta ultimate community can be a leader for minority introduction to ultimate! AL: What is your favorite TV show/Movie/Book/Song/Artist? AL: What sports have you played other than ultimate? AP: I grew up playing basketball and soccer. I never really had an off season, I was either playing basketball or soccer. AL: What do you feel ultimate can learn from those sports? AP: I think those sports have two really big youth communities, especially soccer. Most, if not all, of my friends growing up played soccer at some point when they were younger. Soccer leagues, camps, teams, and organizations are everywhere. I hope youth ultimate can become as big as youth soccer in America. A majority of my summers were spent at team basketball camps. It would be awesome for ultimate to organize team camps during the summer. Of course those two sports have been established for many, many years and I can see ultimate becoming as popular in the future. AL: What can those sports learn from ultimate? AP: The concept of Spirit of the Game is one thing all sports should learn from ultimate. I have made so many friends in the ultimate community and we started as competitors. The amount of respect and camaraderie for your opponents is unmatched by any other sport. I was told several times by my basketball and soccer coaches that you can't be friends with the other team because they are the enemy. It is possible to play against fierce competition and still be friends after the game. AL: Do you have any interesting hobbies or talents? AP: I wish I could say I had a special talent but sadly I don't. I do like to draw but I wouldn't deem it talent-worthy. AL: What are you doing when you aren’t playing Ultimate or working? AP: When I'm not playing or teaching or coaching I am usually trying to chill! I am pretty busy, so any time I can get, I try to relax and rest up for the next upcoming thing. I spent lots of free time with family, friends and my fiancé, Erik. Erik and I spend a lot of time together catching up on TV shows and memes. AL: What change have you seen in the world that you want to see more of? AP: More inclusivity and acceptance and support. I feel like more people are more open-minded. People are more supportive, or at least more outspoken about it. Unfortunately, it feels like more and more people are comfortable with being outwardly intolerant. I would love to see continued efforts to help steer these people towards education. AP: I am a very caring and fun-loving person. I'd say I'm mostly laid back and chill. I like spending quality time with the ones I love. New experiences are cool but I'm definitely not a thrill seeker. I do enjoy traveling and seeing new places. I like to be active but can also be a homebody when I need time to myself. Family is big for me. I love to eat. Food is so good! I probably spend too much time on Twitter and Instagram but there are just too many good memes in the world. Oh also dog pictures and videos, I love dog pictures and videos. AL: How do you find focus in your life? AP: As an elementary teacher, needing time to relax and focus is super important. I enjoy taking naps, very necessary after school. Also watching TV, going for walks, going to the gym or even some social media time on my phone helps me chill out. AL: Who is someone within Ultimate who inspires you? AP: I find inspiration from so many amazing women in ultimate! Could do an entire article on just this question alone but I'll keep it short. Michelle Ng is a big inspiration! She started Without Limits which brought more high level women's tournaments to the South. That was huge for my teammates and myself while I was playing at UGA. I was able to connect with women from all over the country and not just the same local teams. Also Miranda Knowles! I am lucky enough to be on the same coaching staff as her at Paideia. I have learned so much from her. Her knowledge of the game is unreal, I think I learn just as much from practice as the Groove women do. I've also gotten to play alongside her when I played for Atlanta Outbreak. Such a smart player and some incredible bids and throws! AL: Who is someone beyond ultimate who inspires you? AP: There are so many strong women in my life! My mom is one of my heroes for sure. She was a single parent for awhile but I was always supported. My grandmother is another hero of mine. She helped my mom during those single parenting days. Besides strong women, my dad and my brother both inspire me. Black men get negative stereotypes all the time. My dad and my brother are very strong, empowered, caring, loving and hardworking black men. I love my family and am very thankful for their constant support, strength and guidance. AL: What is something, or multiple things, that you take pride in? AP: I take pride in being a hard worker and a good teammate. I always give 100% no matter what I am doing. Same with being a good teammate. I want to be the first person to high five my teammates after points. I try to listen and support when and where I can. AL: What is the key to living a fulfilling life? AP: What a question! Not sure if I have a key, but I do think if you find something that you love or are passionate about, you should find time to do it. Also take time for yourself, that's pretty important and something I need to be better at. AL: Is there anything else you would like to say? AP: Support women, youth and minorities in ultimate! Aaron Liu is a high school student and ultimate player in Madison, Wisconsin. He has been playing frisbee for four years now.